Yet, they may need some extra attention during extreme cold weather conditions. A bit of extra forethought and care will help your birds (and you!) be more prepared as winter settles in. If your time and resources are limited, keep in mind these two primary concerns: drinking water and good ventilation. These are first and foremost. If you have time and resources beyond that, consider a few other preparations which might make winter more pleasant for all of you. 1. Don't let their drinking water freeze. Frequently check your chickens' water supply to make sure it hasn't frozen. Keep an extra supply of waterers on hand and switch out any that have frozen over. 2. Keep their quarters well-ventilated. Enough air should flow through their quarters to be well-ventilated, yet neither damp nor drafty. Moisture should not be able to accumulate and freeze. Periodically remove damp patches of droppings to reduce humidity and improve overall ventilation in the coop. Rake the droppings frequently as well to keep them loose and allow them to dry more quickly. Before cold weather sets in, check the coop and fill in any cracks or crevices you might find. Give your chickens a perch out of the way of any drafty spots — and make sure it is at least two inches wide so the birds can use their feathers as a blanket to keep their feet covered. 3. Keep plenty of scratch on hand. Greet everyone in the morning with a small amount of scratch. This will get them moving, out and about, and in the warm sun. To increase body warmth while they sleep, send everyone off to bed with a little snack as well. 4. Supplement their diet with sprouted grains. Growing fodder for your chickens is easy. Feeding them sprouted grains boosts their vitamin intake and may help with egg production during the typically slower winter months. Your girls should also appreciate warm oatmeal with flax seeds! 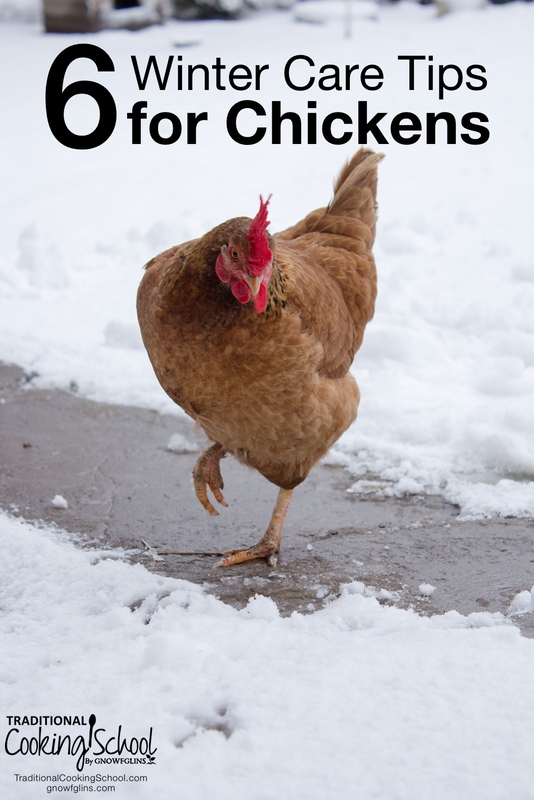 Chickens can get bored when cooped up during harsh weather. To provide them with extra entertainment, hang a wedge of cabbage or an ear of corn from a string and let them peck away. 6. Watch out for frostbite. Depending on the breed, combs and wattles are prone to frostbite. Some flock owners use Vaseline to insulate and protect their flock. If you are concerned about petroleum jelly, use a homemade comfrey salve to prevent frostbite instead. If a comb or wattle is pale, it may have frozen already. If this is the case, hold — but do not rub — a warm, damp cloth on the area to thaw it out. Then apply an antiseptic ointment. Using a supplemental heat or artificial light source can prolong egg-laying. Here in northeastern Oklahoma, our coops are small and the weather is not as extreme. Once the chickens are inside, the warmth generated by their bodies is adequate. Also, we aren't comfortable with the fire risk associated with a heat lamp, although I know a number of experienced flock keepers who use them. Instead of creating artificial lighting, we also opted to go with the flow of the season: eating eggs when we have them, making do when we don't. And actually, our small flock of Buff Orpingtons lays well through the winter months! Be proactive in your animal care. Before purchasing a breed, do your research. Make sure they can handle your climate. Breeds which are well-suited to handle cold temperatures are the large, heavy breeds such as Australorps, Cochin, Langshan, and Orpington. How do you care for your flock during the winter?